Elive is a provider of innovative and stylish aquatic products that create successful and fulfilling aquarium experiences for hobbyists of all skill levels. These products are designed to embrace and cultivate the passion, enabling to get further enjoyment from a long-term hobby with products that set the bar in both design and ease of maintenance. Clean colorful gravel. For bowls and aquariums up to 1 gallon. Gems glow under blue light. . . Replacement membrane for the clearo reverse osmosis filter system bci# 034344. . . . .
Make your fluorescent plants and decor glow. Clips onto any aquarium frame. Add on lights for base led light. 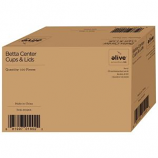 . .
Consumable fixture cups for betta center display 100 count. . . . . Features an individual cup system 30 cup display. . . . .